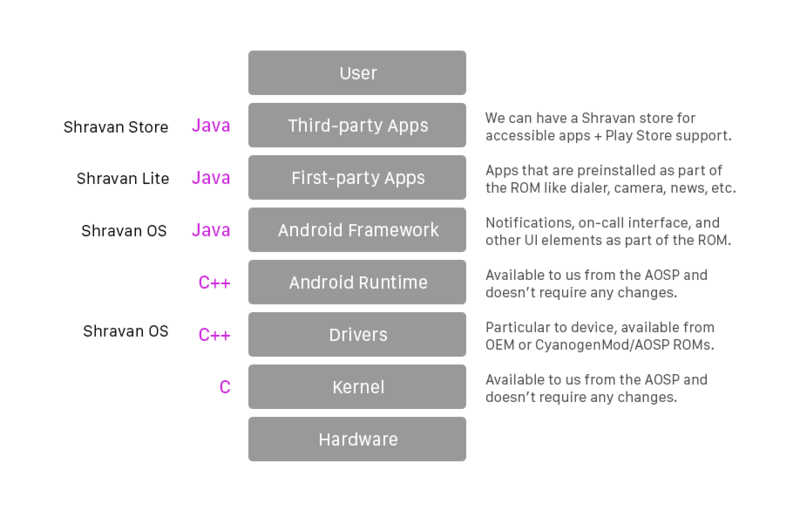 The inclusive and smartphone operating system. Shravan OS is a concept operating system for phones and tablets running Android which uses a patent-pending vibration and speech interface which allows partially or completely blind users use a smartphone with ease. Shravan OS is the first smartphone operating system with built-in integration with Aadhaar, UPI payments, and works in over 25 native Indian languages. It's truly made for Digital India, and supports all 3 million apps in the Google Play Store. Shravan OS is an Android ROM, which means it comes with the security, reliability, and compatibility of the world's most popular OS, Android. All Android apps work out-of-the-box. Shravan OS is built on Oswald Labs Platform, an extensive suite of products, open-source projects, and developer APIs and SDKs to build tools to empower the next billion users. Shravan is a trademark of OswaldAble Technology Private Limited, doing business as Oswald Labs. The Shravan brand name, logo, and identity is protected by copyright under Indian and international law. Some features might not work in all smartphones or in all locations. Requires a connection to the internet. Android and the Android logo are registered trademarks of Google LLC.